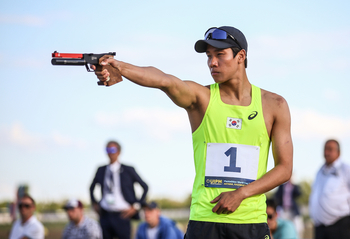 First the world, now the World Cup is in the hands of Jung Jinhwa of Korea after he won Men’s Individual gold at the UIPM 2018 Pentathlon World Cup Final. The good news continued for Korea when Jun Woongtae followed his team-mate across the line to win silver after a stunning Laser-Run. Joining them on the podium was Arthur Lanigan-O’Keeffe, who went one better than partner Natalya Coyle 24 hours earlier as he won a historic first Pentathlon World Cup Final medal for Ireland. Jung (KOR), 29, enjoyed a career highlight in 2017 when he won gold at the Pentathlon World Championships in Cairo (EGY). Now he is in possession of two of the three biggest prizes in the sport – as well as the world No.1 ranking – with the 2020 Olympic Games in Tokyo only two years away. Jung started the Laser-Run in 1st place with a 24sec lead after a strong performance throughout the final. 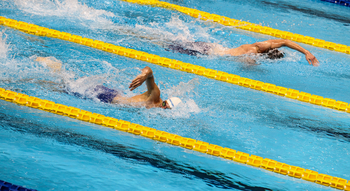 His success continued the remarkable rise of Korea as the most powerful team in men’s pentathlon. 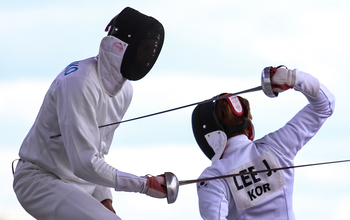 Jun (KOR) and Lee Jihun (KOR) had already claimed two of the four gold medals on offer during this year’s Pentathlon World Cup circuit. Gold medallist Jung (KOR) said: "The World Cup season has been difficult but I had a few days' break before the World Cup Final and that was a very good choice. “Today was very, very difficult b ut it was a fantastic race. There were many people in the group behind me but I didn't think about them. My focus was on first place. "I'm ready now to focus again on the World Championships." Jun (KOR) added: "Today I am the silver medallist and I am very happy, and my team-mate is gold medallist so there is even more happiness in the team. "The Laser-Run was very difficult, trust me, but I just stayed focused on myself." Lanigan-O’Keeffe (IRL) and partner Natalya Coyle have won gold in the Mixed Relay two years in a row but neither had come home with an individual medal until today – despite Coyle’s best efforts in finishing fourth in the Women’s Final yesterday. 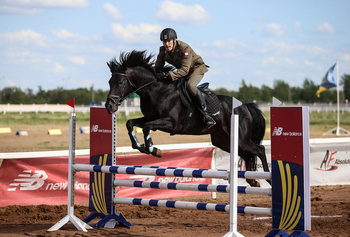 Lanigan-O’Keeffe (IRL) was European individual champion in 2015 and confirmed his excellent form with gold at Pentathlon World Cup Sofia only a few weeks ago. He admitted that the sandy running track had made life difficult for the group of athletes locked in an intense battle for podium places behind the leader Jung (KOR). He said: "It was a very tough course and the sand was deep in places. On the last two laps, everyone around me was feeling it and it was a real battle of guts. "Anything can happen in Laser-Run and you never know if the leader will keep his head, so I never gave up hope of gold, but Jung was the best man today. "I just kept chasing everyone who was in front of me, and I managed to get past the Russian [Alexander Lifanov] but I couldn't quite catch the second-placed Korean. They have a great team." Reigning world champion Jung (KOR) was the outstanding performer on the piste with 25V/9D and two points added during the Bonus Round. Yuriy Fedechko of Ukraine was next best with 23V/11D while Alexander Lifanov of Russia and Giuseppe Parisi of Italy scored 22V/12D. Lanigan-O’Keeffe (IRL) kept in touch with the leaders with 20V/14D, same as the Olympic champion Alexander Lesun (RUS), but Jun (KOR) faced an uphill task after scoring 18V/16D. Bence Demeter of Hungary added six points to a disappointing Ranking Round score during the Bonus Round. World Under 19 champion Ahmed Elgendy of Egypt was quickest in the pool with his time of 2:00.34, although Lanigan-O’Keeffe (IRL), Jun (KOR) and Jung (KOR) were not far behind him on 2:01.91, 2:02 and 2:02.75 respectively. Another day, another high-class display of horsemanship in Astana with nine athletes enjoying clear rounds, including Jung (KOR), whose composure ensured he would have a massive Laser-Run lead of 24sec. 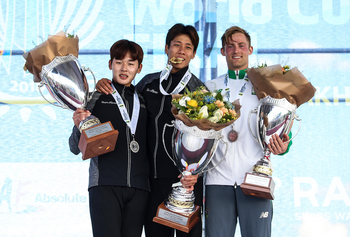 Lanigan-O’Keeffe (IRL) also went round clear to give himself a shot at the podium, while Lesun (RUS) and Lee (KOR) joined them with a top score of 300. The other riders to enjoy an unblemished round were Ilya Palazkov of Belarus, Patrick Dogue of Germany, Shohei Iwamoto of Japan, Christopher Patte of France and Gergely Regos (HUN). Jun (KOR) dropped seven points for a Laser-Run starting position of 9th, while Fedechko (UKR) also conceded just one penalty to protect his overall position of 2nd. Jung (KOR) enjoyed an uneventful procession to victory, protecting his 24sec lead with all the professionalism of a world champion. Behind him, battle raged on Astana’s sands. Fedechko (UKR) quickly dropped out of the race for the medals, with Lanigan-O’Keeffe (IRL) and Lifanov (RUS) taking the initiative – but it wasn’t long before they realised they had company. Jun (KOR), who has already won three Pentathlon World Cup gold medals at the age of 22, moved rapidly through the field from his starting position of 9th, and before the halfway mark of the race he had staked a strong claim for silver. Jun (KOR) ended up with the fastest Laser-Run of the day (11:28.75) and in the end he crossed the line only 5secs behind his compatriot Jung (KOR), who took it easy at the end. Lanigan-O’Keeffe (IRL) stalled at the final visit to the shooting range, and Lifanov (RUS) took advantage by moving into the bronze medal position, with Palazkov (BLR) also entering the medal equation in 5th. But the champion of Pentathlon World Cup Sofia was not done, and Lanigan-O’Keeffe (IRL) muscled his way back into the podium places by marching past Lifanov (RUS); he even put pressure on Jun (KOR) in the final stages of a gripping Laser-Run. UIPM President Dr Klaus Schormann said: “We have not had the opportunity to organise such high-level pentathlon competitions in Kazakhstan in the past 20 years and I am quite happy with the presentation of this Pentathlon World Cup Final in the capital, Astana. “I must compliment the horses and I must compliment the athletes, who have produced a very good performance, increasing the level and showing their abilities to the world via internet and television. Leonid Zimarev, Secretary General of the Modern Pentathlon Federation of Kazakhstan, said: “The competition has gone perfectly, the winners and medallists earned their reward, the race was amazing, the competition was held at a high level including the technical side of it, and all teams put 100 per cent effort into their performance. 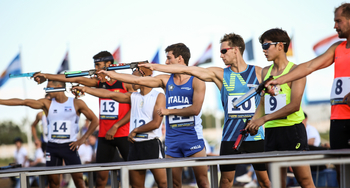 UIPM Pentathlon World Cup Final Astana concludes on June 24 with the Mixed Relay. A live stream of the Laser-Run is available on UIPM TV and up-to-date results of all competitions are available at the UIPM website.